Location: Watson St., between Geathers St. and Russell St., Orangeburg, S.C. Spurred by the protest at the All-Star Bowling Alley just two days prior, a frustrated mob of about 200 started a bonfire and riot on South Carolina State University's campus. On February 8, 1968, the crowd threw bricks, bottles, and firebombs out of frustration at the blatantly racist situation. Police and firemen were called to extinguish the fire, but when police believed they were under attack, they opened fire into the angry mob of unarmed students. Three young men—SCSU students Samuel Hammond and Henry Smith and Wilkinson High School student Delano Middleton—were killed, while 28 others were injured. 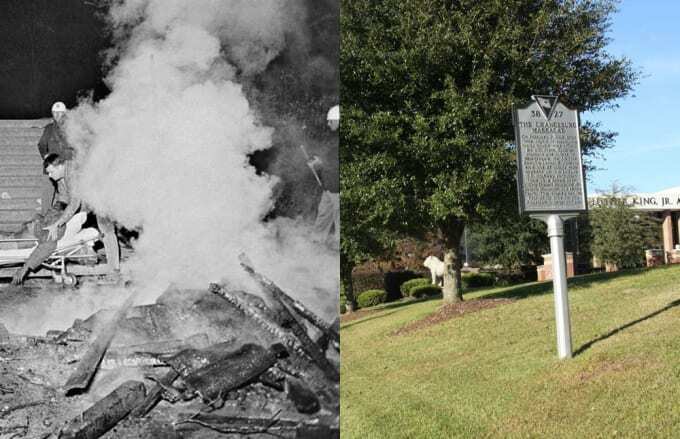 Predating the Kent State shootings and Jackson State killings, the Orangeburg Massacre was the first incident of this nature in the United States, yet got little-to-no media coverage. In the years following the incident, the school's gymnasium was named after the three young men who lost their lives that night. There is a statue on SCSU's campus in their honor, and a historical marker was placed in the spot of the incident by the university in 2000. The state general assembly recently decided that February 8 would become a day of remembrance for the students killed and injured during the protest.